Rare antiquities have museums, fine wines have cellars and luxury automobiles have garages. However, not just any old garage will do for a super car. To find the ultimate garage in the United States, both real and imagined, Maserati and design magazine Architectural Digest teamed together to offer the “Design Driven” competition. From March to June 2009, contestants were able to submit digital photos with a short description of either their existing garage or garage design concept to the Design Driven web site. Only unique, never-before-published and awarded entries were eligible. The Italian automaker selected a winner for both categories based on the submissions’ architectural significance, design, individuality, and suitability as an environment for a Maserati-brand vehicle. Both winners were featured in the October 2009 issue of Architectural Digest. 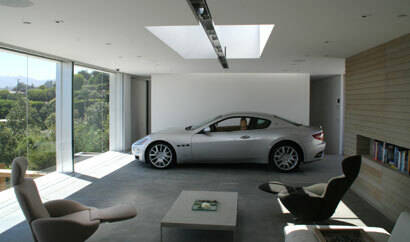 We had the opportunity to see the winning existing garage, entry #260 from Holger Schubert, firsthand in Los Angeles. This minimalist carport, measuring 1,200 sq. ft. and including eco-friendly materials and roof-mounted solar panels, was designed to focus on the parked automobile as a piece of art. Located on the upper floor of a home overlooking west L.A., this automotive/architectural statement of understatement is accessible via a bridge separate from the property’s main entrance. Inside is a spot for a car as well as a large open room for a couch, slide-away television, small kitchen, bathroom and library. A nine-foot-long steel ramp — normally flush to the parking space’s concrete floor — can be raised five inches with a remote control to make the car roll backwards out of the garage, where it can then be started. LED strip lights, a skylight and multiple low-voltage spotlights in the ceiling (and twelve flush mounted uplights in the floor) add to the structure’s gallery-like ambience.